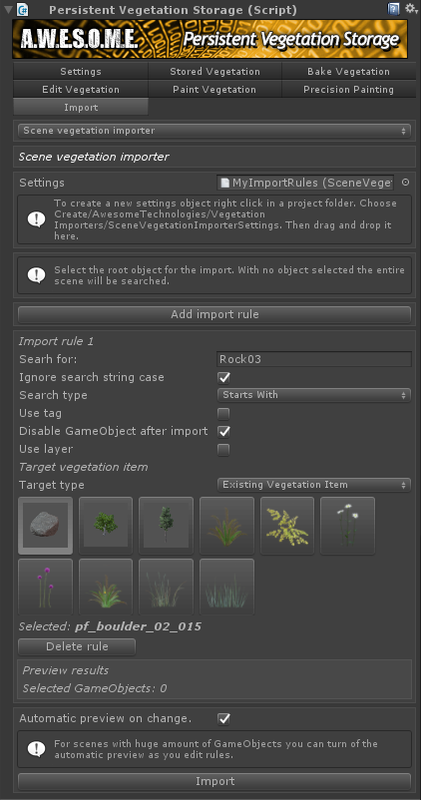 The scene vegetation importer will help you import existing vegetation and rocks from the scene. It will search the scene and match objects based on filename, tag and layer. Then add the instances to the Persistent Storage. You create a importer profile with right clicking in any project folder. Choose “Create/Awesome Technologies/Vegetation Importers/Scene vegetation importer settings”. Give the settings a the name you want and assign it to the importer. The profile can hold many import rules and allows you to re-use this between scenes/projects.